Kathrin Nicholson of Westside Estate Agency, who has the listing of the gated French country-style home that is two minutes from Sunset Boulevard, tells AOL Real Estate that one of her favorite features of the home is "a great set of huge vintage wood doors that Dennis and Kimberly put in to enter the master suite. They add a wonderful ambiance and set the scene for entering the room." The 8,400-square-foot main house, with 8 bedrooms and 8½ baths, has a master suite with a fireplace and private balcony. Fireplaces are also in the gourmet kitchen, the beamed living room and the covered loggia that overlooks the swimming pool and spa. A converted gym sits above the kitchen, but the space can be used as a maid's quarters. There is also an office and a wine cellar. The home sits on two acres with a putting green and year-round creek, and has a barn, coral and private horse/hiking trail to Will Rogers park, where one can also bike or miles. The property also includes a second house and a studio. When Quaid, 56, purchased the property in 2005 with his new bride (they were married on July 4, 2004) Zillow reports they paid $1.83 million for the 2004-built home, but Nicholson says it was for "much more than that," although she can't disclose the amount. Other property records indicate the actual purchase price was $7.965 million. It is possible the lower figure Zillow used is what the previous owners paid in 1999 for a three-bedroom home they knocked down before building the current home. Shortly after moving in the Quaids also purchased the neighboring property, a 2,100-square-foot one-bedroom, two-bath home with an additional studio and kitchenette that had been listed for $6 million. It's unknown how much they purchased that property for, but Nicholson says they combined the two lots to create the estate. The couple sold a home in Brentwood around that time. Nicholson, who says although the housing market has obviously slowed, "there are still people with money looking for special places, so if a home is priced well and done well it will sell. There aren't that many in this part of Los Angeles to start with. The beauty of this home is that it's not like a ranch so non equestrians can enjoy it as well." Quaid, who is currently filming Beneath the Darkness in Smithville, Tex., has been seen around Austin golf courses, clubs and restaurants "a good deal lately," reported the Austin American-Statesman. Buffington, just might be excited to raise the couples three-year-old twins closer to her family and get back to family business. Her father, Thomas B. Buffington, is the CEO of Austin-based Buffington Signature Homes, for which she has sold homes. Quaid, who was born in Houston to a real estate agent mother, met his third wife in 2003 in Austin when a mutual friend introduced them at a dinner. They've been a rather low-profile couple, especially compared to Quaid's older brother, Randy and wife Evi, who have been arrested for squatting in a California home, as we previously reported, and even tried to seek asylum in Canada. Quaid has a son, Jack Henry, with his second ex-wife, actress Meg Ryan of "Sleepless in Seattle," who recently leased a three-bedroom apartment in New York's SoHo area for $25,000 a month while she tried to lease out her Bel Air home for $40,000 per month after it didn't sell. The Quaid twins, Thomas Boone and Zoe Grace, who were born to a surrogate, pushed their parents personal life a bit more into the public eye, however, when after they were admitted to the hospital for treatment of a staph infection and were given a near fatal overdose of a blood thinning medication. The twins are now doing fine, but the Quaids initiated a lawsuit against the pharmaceutical company (Illinois-based Baxter Healthcare Corp.) that makes the blood thinner, because of its ambiguous label packaging, reported the Daily Mail. Despite the troubles and the stress of a move, the Quaids will certainly have more than enough space and easy access to quality hospitals to continue raising healthy boys. The renovated Austin home that the Real Estalker reports the Quaid's purchased, is 11,103 square feet with 6 bedrooms and 7 full bathrooms and 4 half ones. The home also has a kitchen with mahogany cabinets and green marble floors and green marble counter tops, which might just get replaced. Same goes for the crocodile skin-textured wallpaper in one of the bathrooms. All should be well, so long as he doesn't let his big brother move into the guest quarters. 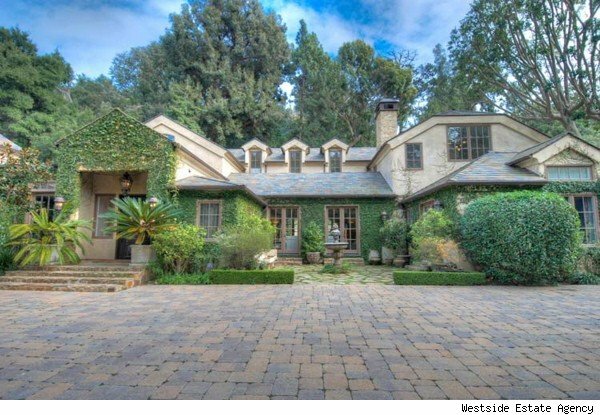 This is the front of Dennis Quaid's equestrian estate he is selling. See 67 more photos of the home. Sheree R. Curry, who has owned three homes and likes horseback riding, is a three-time award-winning journalist who has covered real estate for six years. During her 20-year career, her articles have appeared regularly in the Wall Street Journal, TV Week, and Fortune. She's been writing for AOL Real Estate since 2009 from a Minneapolis-area rental. She seeks a book publisher -- or at least a lender who'll give a reasonable mortgage rate to a self-employed mom.